What is it about ladybugs that inspires such affection? Is it their pleasingly symmetrical half-oval appearance? The fact that they don’t sting? The splotchy decorations on their carapace, which resemble a child’s first attempt at fingerpainting? Or perhaps their dogged, mild-mannered way of crawling to the top of whatever they land on, spreading their outer shells to reveal an unexpectedly complex structure of hidden wings, and flying gracefully away? Whatever the explanation is, people love ladybugs. Europeans, in fact, put them under the protection of supernatural forces. In Germany, these critters are called Marienkäfer — "Mary beetles" (yes, that Mary). Not to be outdone, the Dutch take ladybug adoration to its logical conclusion. I have it on good authority from a Belgian friend (and remember, Flemish Belgians don’t speak Flemish, they speak Dutch. Note that well. ), that in Dutch, a ladybug is an Onze-lieve-Heersbestje. Literally translated, "Our-dear-Lordbeastlet", or more flowingly, "the little beast of our dear Lord." Almost makes you want to move to Holland (or Belgium), doesn’t it? P.S. Off to England tomorrow. Hope to post some updates while I’m there, but in any case check back next week, when I’ll resume "providing content." Why Marx will Never “Sell” in the U.S.
One of the things that sometimes irritates me, as an American living in Europe, is the fact that Noam Chomsky and Michael Moore take up so much oxygen in Europe. When Europeans want to read an analysis of American society or policy that makes them feel good, that seems to be written from a "European" perspective, that confirms their existing prejudices and stereotypes about the United States, they turn to these two figures. Almost everything they write is translated immediately into German, and the books are displayed prominently in all major German bookstores. But I’d also urge moviegoers to see "Control Room," Jehane Noujaim’s documentary about Al-Jazeera’s coverage of the Iraq War, a piece of filmmaking that, like Moore’s movie, is antiwar in the broadest sense. But it’s also one that, unlike Moore’s, is well aware of the dangers of self-certainty and easy answers. Noam Chomsky, by contrast, doesn’t get much coverage at all in the United States. Sure, he produces plenty of books, some of them very interesting, some of them weirldy conspiratorial. They tend, however, to be read mostly by people who are already Chomsky fans. (To put it in German terms, would you go right out and by the latest book by Gregor Gysi, assuming he wrote one?) Chomsky’s books make no impact — zero — on the opinion of the average American, and even on the opinion of the average left-of-center American. A guy who has had such an impact, though, is Thomas Frank. No, you Germans have never heard of him, because, to my knowledge, he’s not been translated into German yet. But he wrote a fascinating and well-researched book called What’s the Matter with Kansas?, which attempts to answer the question why working-class people vote for Republicans, even though this seems to be contrary to their own economic interests. There’s a discussion of this book underway on a new website called tpmcafe.com, which is a sort of online salon in which prominent American left-of-center intellectuals, journalists, and politicians can gather and debate. If you read the whole thing, you’ll get an idea how little influence Marxism has had on the American left. In fact, Marx is so irrelevant that most people on the left in the U.S., like Frank, never bother to carefully study his ideas, although they do know the main lines of thought. So now you know the names of a few more American social critics who are, in my opinion, a lot more interesting and relevant than the people who get translated into German. Go buy their books! The Bayreuther Festspiele are now in full swing. Unfortunately, the German Joys Cultural Affairs Unit was not able to finance a trip to the festival this year, so there will be no live reports. If one has not heard Wagner at Bayreuth, one has heard nothing! Take lots of handkerchiefs because you will cry a great deal! Also take a sedative because you will be exalted to the point of delirium! He told her that he had left Parsifal with ‘broken bones’! Last night, as usual, I poured myself a nice steaming mug of hard liquor and curled up with a good book before going to bed. Hours later, I was still awake, still flipping pages, transfixed. I had stumbled on Detlef A. Huber's magisterial treatise Die Hagelversicherung — "Hail Insurance." Of course, every educated adult is familiar with this extraordinary legal institution, but rarely do you see its history recounted with such verve and imagination as by Detlef Huber. The first hail insurance policy was written in 1733 near Leipzig by one Carl-Gottlob Waldscheisser. Business rapidly took off, but was crippled when Kant, in 1774, published his Zur Entwicklung einer philsophischen Stellungnahme über die Hagelversicherung ("Toward the Development of a Philosophical Position on Hail Insurance"), in which he argued that the idea of insuring against weather phenomena which reflect manifestations of the innate order of the universe could not be tolerated in a just and rational society. Under Kantian influence, the Prussian administration outlawed hail insurance in 1778, and it was only Hegel's famously obscure treatise on the same issue in that set the stage for a lift on the ban in 1834. After that time, hail insurance played a leading role in German history. Many historians believe that an extortion attempt based on Prussian Chancellor Otto Von Bismarcks' participation in a questionable hail-insurance syndication scheme were the real reason for his fall from power in 1890, and the Hail Insurance Riots, caused by inclusion of a clause banning hail insurance "on German soil" in the Treaty of Versailles, were an important factor contributing to social unrest in Weimar Germany. Finally Huber recounts the well-known story of the 1936 National Socialist law — the Gesetz zur Gleichschaltung des deutschen Hagelversicherungswesens ("Law on the 'Co-ordination' of the German Hail Insurance Industry"). With evident anguish, Huber chronicles how this law perverted the ancient German institution of hail insurance into a weapon of state profit and political oppression. Huber then turns to the modern era of hail insurance: the de-nazification trials of the National Socialist hail insurance executives and the rehabilitation of the industry into one of the "pillars of the economic miracle" (as it was called by German Finance Minister Ludwig Erhard) in the 1950s. East Germany blamed pollution created by capitalist factories for the phenomenon of hail, but its legendary "people's campaign against hail" of 1959-1964 was nevertheless a spectacular failure. Finally, Huber chronicles the conceptual battles fought among legal scholars and policy-makers during the 1970s "hail insurance wars" (thankfully, this time the wars were merely rhetorical), in which the "progressives" (who wanted hail insurance to be made available for damage to cars or other personal property) and the "conservatives" (who wanted to protect its traditional role as a protector of crops). The amazing story of hail insurance is told by Huber with gentle humor and deep insight. Therefore, Die Hagelversicherung is a strong recommendation for all readers of German Joys. Crime has an Ontology? I missed that memo. Hello Joysters! As we all know, things pretty much shut down in Germany as August approaches, since Germany is not yet a part of the Anglo-Saxon 24/7 Economic Productivity Coercion Zone. Why, just today, as I shopped for furnitute on the Koenigsallee in Duesseldorf in the middle of the afternoon, I was surrounded by thousands of other people doing the same thing. Most of them were well-dressed and of working ago, and many of them were not only not working, they were also not shopping. They were doing absolutely nothing at all! I thought: "hey, shouldn’t a lot of you be in an office somewhere? After all, doesn’t someone have to actually produce something of value in this country to pay for goof-offs like me?" Perhaps not — at least until the conservatives come to power. Let’s enjoy it while it lasts. Of course, German Joys, in the spirit of cultural solidarity, will probably slow down a bit too in August, as its main author takes some nice, interesting vacations. I do hope to be able to get to a computer and perhaps post some travel updates for everyone to read. The formatting might be a little strange, because Typepad is odd that way. But before everything becomes all cultural and relaxing, it’s time to break the minds of my readers with something awesomely intellectual and complex. German law, that is. I’m not going to be talking about the legendary German Civil Law Code (the Buergerliches Gesetzbuch or BGB), which was composed over decades by some of Germany’s most brilliant legal scholars, came into force at the beginning of last century, and is regarded as a monument of comphrehsive abstraction. It’s influenced the legal systems of countless nations, some of which simply adopted it wholesale. The problem with the BGB, though, is that it deals with boring stuff like contracts and wills and capacities. Blah blah blah. I don’t do that stuff. The only law I’m interested in is criminal law and criminal procedure. And, it turns out, Germany’s got a giant, ultra-complex labyrinth of doctrine there, too! To learn a bit more, visit this wonderful short article at the German Law Journal, a website that provides fascinating commentary on German and European Law in English. It’s written by an American law professor who specializes in comparative law from a German perspective, Markus Dirk Dubber. Now the notion that there could be such a thing as a solution to a case, which might be correct or not, is quite foreign to Anglo-American law, which instead emphasizes that there are always different ways of analyzing a case, and different ways of resolving it, depending not only on the formulation of the relevant legal norms but also, equally important, on the statement of the facts of the case. Similarly unfamiliar is the idea that a system of criminal law would qualify as a scientific achievement (never mind one that would rank among “the great achievements of the human sciences”). These two features of German criminal law are related: there is a solution to every case precisely because law is a science. Sounds too good to be true, doesn’t it? Well, it sort of is. Because the whole idea of the law providing the "right" "solution" depends on how you interpret the basic concepts, and German criminal scholars fight like cornered rats about what those concepts actually mean. I subscribe to a German criminal law review, and recall recently reading an article in which one professor attacked another in the most vitriolic terms, accusing him of using all the kinds of cheap and unfair methods of argumentation under the sun, and repeatedly calling the other professor’s honesty and competence into question. The substance of the dispute — as far as I could figure it out — was whether a court had used the proper definition of "negligence" (fahrlaessigkeit) in some judgment or other. Oh well, as we say in the U.S., at least it keeps them off the streets. Thanks for the comments about the Element of Crime post. Erdmöbel: "earth-furniture?" Since I am also a big fan of Prefab Sprout, I will be going straight to the store to buy some Erdmöbel. But now, to the GWOW. I was spending a normal Saturday morning pursuing one of my favorite hobbies: watching documentaries about advanced weapons systems. A U.S. Marine engineer described the possibility of encasing torpedos and perhaps entire submarines in a giant air bubble. This would allow them to slide through the sea-depths as fast as air bubbles themselves; that is, with practically no resistance at all. One day, we might see submarines that move almost as quickly as airplanes. However, the German voice-over cautioned, this idea remains pure Zukunftsmusik (futuremusic). dict.leo.org, as helpful as it is stodgy and unimaginative, defines Zukunftsmusik as "dreams of the future." (Titanic magazine regularly features surreal and dystopian paintings by the artist Nic Schulz entitled Zukunftsmusic, with a "c" at the end. Creeping Anglicization of the German language, or irony?). German pop music rarely catches the rest of the world’s attention. Unless you live in Germany, your notions of German pop are likely defined by fleeting memories of Nena’s 99 Red Balloons, Falco’s Der Kommissar, or Trio’s Da-da-da. Good (or bad) for a couple days’ humming, but not much more. Many Germans, on the other hand, will harbor fond memories of the early 1980’s Neue Deutsche Welle (“New German Wave”) flowering, featuring bands like Markus and Geier Sturzflug. No, you English-speakers have never heard of NDW. Although the lyrics of some NDW bands could be clever and political, the music is little more than casio-generated, tinny, foursquare early-80s dance pop. Think Flock of Seagulls or Bananarama, recorded in someone’s bathroom, and produced by their uncle. After 8 or 9 of these numbers, with their repetitive, pounding march-like tempi, you’ll be thinking: Jesus, I’ve heard more syncopation in a Brahms symphony. On the other end of the scale are the genius-freaks at the fringes, such as the inimitable 70’s electro-glitch-click pioneers Kraftwerk (who come from Düsseldorf), operatic wild woman Nina Hagen, and industrial nutcases Einstürzende Neubauten. The icy genius of Kraftwerk, in particular, hasn’t dated at all. But where, you ask, where is the middle ground between lollipop, chainsaw, and drum machine?Where’s a German band I can pop into my CD player, and enjoy even if I don’t understand the lyrics? There are a few one could name, but my favorite, hands-down, is Element of Crime. Don’t be put off by the fact that the band shares a name with a movie by über-poseur Lars von Trier. They sang in English in the 1980s, but only began producing masterpieces when they switched back to German in the 1990s. Since that time, they’ve released gem after gem. EoC produces sumptuously atmospheric pop, with real instruments (including trumpet, accordion or Hammond B3 for variety). When you listen to EoC, you’ll feel at times as if you’re in a cabaret, at times in a seedy café past closing time, at times in someone’s living room. But you’ll never imagine you’re in an Oktoberfest tent. Never. The lead singer, Sven Regener, combines Waitsian graveliness with a sort of gruff vulnerability. Culture Week takes a literary turn, with my own translation of a poem by Gottfried Benn, a modern German writer little-known in the English-speaking world. Benn, a dermatologist and venereal disease specialist (the two disciplines are, for some reason, always studied together in Germany), lived most of his life in Berlin, where he died in 1956. He wrote novels, essays, and poems — some faintly gruesome and nihilistic, some limpid and lovely. ‘like the first name’ — please, don’t strain your memory! who wore the pure brow of angels. still don’t know it today and have to go now. First, thanks so much for responses to the anonymous burial question. I find them anthropologically fascinating. As Clifford Geertz once said, "Society’s forms are culture’s substance." And now, Culture Week continues at German Joys! We move from the sad subject of dead pets to the engaging question of What Makes a Good European Movie. I’ve seen plenty of European movies during my stay here, including many that are too quirky or minor to be released in any English-speaking country. I have formulated a General Theory of European Cinema: every European movie is made in a process of conscious rebellion against Hollywood values. The creators of these movies have enough money to make a movie (usually through generous subsidies), but have neither the resources nor the desire to compete with Holywood’s airbrused escapism. Characters are allowed to have crooked or stained teeth, lumpy breasts, small penises, or hairy bodies. When they are shown taking a bath or changing, you see them stripping their clothes off matter-of-factly, without any drama or music. No clever camera tricks: if a dangly pink reproductive bit hovers into the picture, it stays there. The people in the movies need to drink a lot of liquor to take a social risk. They may think of a perfect riposte only minutes or hours after it’s called for. Usually, they can’t think of it at all, and simply shamble away from the site of an insult or disappointment. They have a hard time finding things to say to their spouses and other family members. They’re often immigrants, refugees, or blue-collar workers. We see them living their ordinary lives. No voice-overs, flashbacks, or obtrusive narrative tricks to alert us to their mental status or moral qualities. Questions that pop into the viewer’s head (why does he wear that shirt all the time? Who is that old woman who lives with them?) can only be answered when one pays close attention. Sometimes, they can’t be answered at all. At the end of the movie, there’s no swelling crescendo, no tearful redemption. Perhaps something happens that’s a little more significant than in the rest of the movie, but not by very much. Then the screen fades to black and we see credits, accompanied by pensive cello music. I call these shy movies. They seem almost embarrased to be claiming your attention for two hours, and tell their story in a tasteful, discreet way. When they’re poorly (or self-indulgently) made, they can be boring; after all, if I want to watch two people failing to communicate with each other in real-time for 5 uninterrupted minutes, I can do that in the subway. But done well, the European slice-of-life film creates an uncluttered narrative space for understated, honest stories about the human condition. It makes the typical Hollywood confection look fake and brassy. In a day or two I’ll post a review of one such movie: Schulze Gets the Blues, one of my favorite German movies. In the meantime, I’d be happy to hear suggestions of other good slice-of-life films. Now I’ve got a real question for my readers. 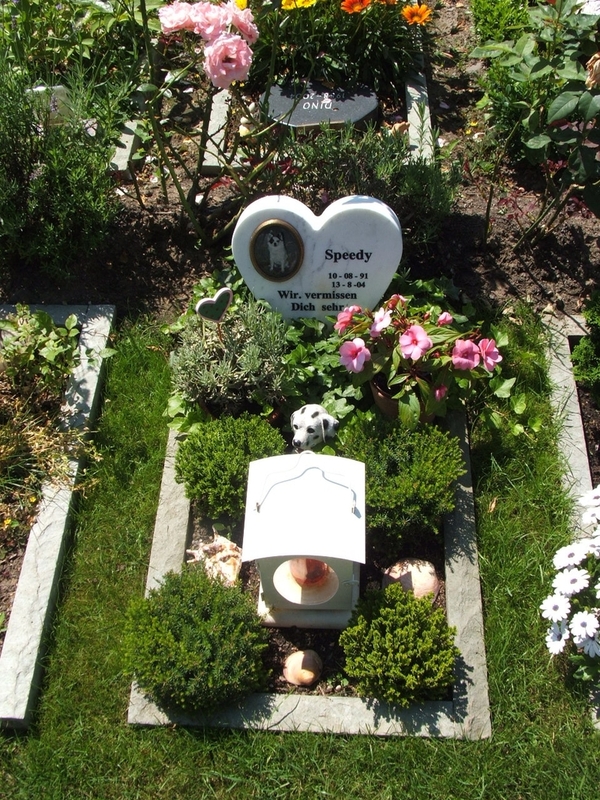 When I walk through German cemeteries, there is always a section for "anonymous graves," and almost every funeral home offers anonymous burials. As this article on German funeral customs explains: "many people choose an anonymous grave with no headstone (something that’s found in Germany’s European neighbors but virtually unknown in North America)." According to the same article, 27 percent of the burials in Hamburg are anonymous. 1. What’s the typical profile of someone who is buried anonymously? 2. Presumably you would have to arrange this before you die; how do you accomplish that? 3. Most importantly, why would you choose to be buried anonymously? I’m sure I’m not the only expat who’s asked himself these questions. Any answers would be much appreciated. As I promised, this is the Week of Culture here at German Joys. And what marks a culture more than its death-rites? Many experts report that we’ve all got to die. So, of course, do our pets. 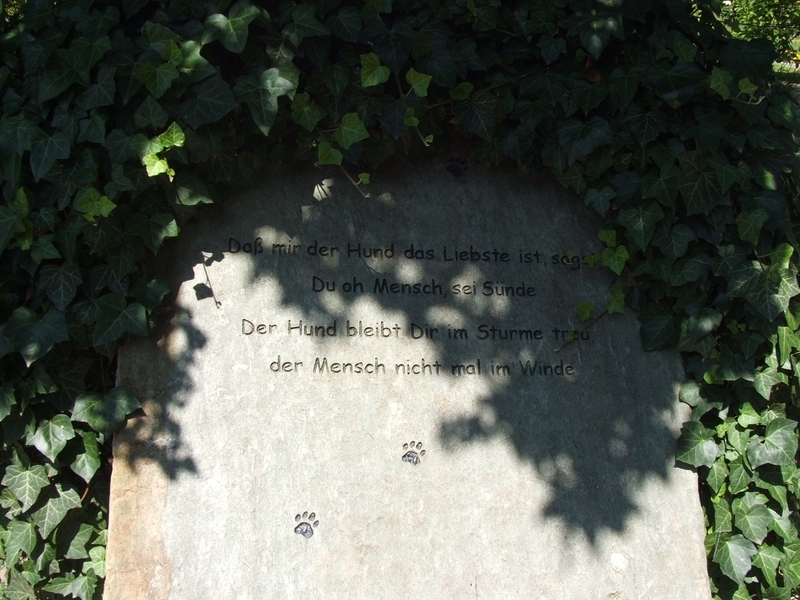 To investigate further, I obtained some travel funds from German Joys Cultural Research Fund and paid a visit to the Duesseldorf Pet Cemetery (Tierfriedhof — The German word for cemetery, Friedhof, can very roughly be translated as "yard of peace"). And you say "the thought’s a sin!" And man? Not even in wind. 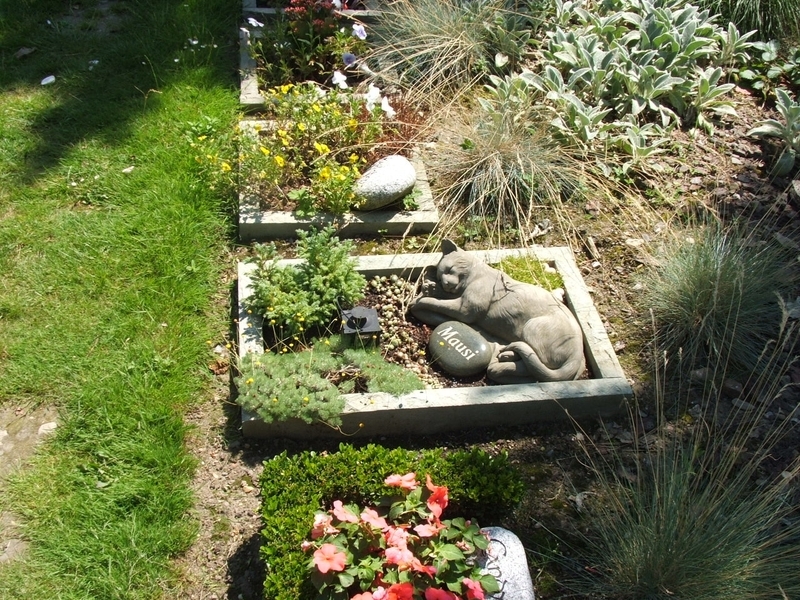 A lot of love and care went into these pet graves. And a lot of order. No matter how filled with plastic kitsch, each grave had a logical design, and was impeccably maintained. They were like a series of postage-stamp Schrebergarten. The red candle or lamp on them is called a Grabkerzen, and is theoretically never to be allowed to go out. Shamefully enough, I only saw one still-burning Grabkerze at the pet cemetery, which doesn’t speak well of Germans’ real attachment to their dead pets. At least the unilluminated neglected pet graves won’t product the effect you see at German human cemeteries at night, where you will be surrounded by hundreds of eerie, flickering red lights. Or are they the glowing red eyes of ravenous Satanic trolls and devil-wolves, just waiting to spring out of the bushes and devour you alive? But I digress. Now, back to the cemetery. Some graves bore stuffed animals (see Ba lu’s grave to the right), some plastic hearts, some faded photos of the deceased companion. 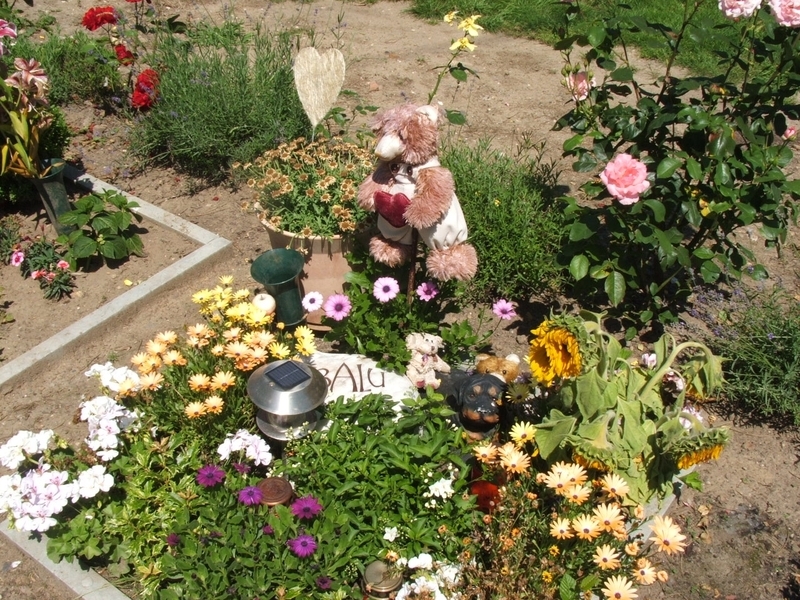 Most of t hem had the beloved creature’s name engraved on a stone, like Balu here. Speedy (left) got a picture and a heart-shaped marble headstone with his photo and the epitaph "Speedy we miss you a lot!" Other graves were more restrained. Many had no plaque at all, just a modest assortment of flowers or small design in the earth. But the one grave that moistened the e yes even of German Joy’s icily obective correspondent was the grave of dear, sweet little Mausi (right). Yes, there she is, curled up, eternally dreaming of scampering mice, elusive flies, and warm windowsills. Rest in peace, Mausi. I hate to keep going on about politics and bombings, but it is in the news lately and there’s a lot to say. Besides (sniffle) they’re the only posts anyone (sniffle) responds to. Just to punish everyone for being too political, I am announcing Culture Week at German Joys. Next week, not a single post about politics. Not one. All culture and all people. Sure, I’ll lose half of my readers, but the ones who stick with me will be the very special ones. The biggest challenges European countries will now face are two-fold: how to deal with the young offspring of immigrants living in Europe who have become captivated by the idea of global jihad, and how to deal with their own, self-imposed restrictions. Investigators are hampered in their efforts to pursue Islamic terrorists by Europe’s open borders, by a lack of effective communication among intelligence agencies and, finally, by a lack of uniformity in counterterrorism strategies. Their adversaries, on the other hand, are highly mobile, networked across the entire continent, supported by sympathizers and powerful financiers, but also able to operate independently. This new generation of holy warriors has already established sufficiently deep roots in Europe to be able to move about freely and without attracting attention. Many have German, Spanish, British or French passports. They often speak several languages, are employed, and develop their attack plans in their free time. Security officials are dealing with fewer and fewer Islamic extremists who have just arrived from abroad — with the exception of globe-trotting preachers of hatred. The article shows, once again, that the principal danger is not posed by the alienated and unemployed. [Alleged assassin of Theo van Gogh Mohammed] Bouyeri himself also typifies the new Euro-Islamists. He seemed to be an extremely well-integrated Muslim — that is, until he suddenly drifted off into the world of Islamic extremism. His parents arrived in the Netherlands in the 1960s, and he was born there. He held Dutch and Moroccan citizenship, finished high school with good grades, and went on to study computer science at a Dutch university. [N]o one expected that someone like Serhane Ben Abdelmayid Farkhet would become radicalized. The 36-year-old Tunisian studied business administration in Madrid, was married to a Moroccan, and seemed, for all intents and purposes, headed for success in the West. In fact, Farkhet was, for a while, his real estate company’s top-selling agent. But under the influence of a radical friend, Farkhet transformed himself into an agent of death. He secretly met with al-Qaida agents in Istanbul and, in Spain, helped assemble the March 11 group of attackers. On April 3, 2004, the Spanish police attempted to storm a Madrid apartment building where Farkhet and six accomplices were hiding. Before the police could apprehend them, the seven men blew themselves up. I’m sure I’m not the first to say this, but when I read profiles like this, I am struck by the similarity of the operational methods of Islamic revolutionaries and Marxist ones. In each case, the underground organization needs not only foot soldiers but intellectual leaders. The leaders have to be intelligent and disciplined; they must not only master a complex ideology, but also transmit that ideology to less well-educated foot soldiers, and simultaneously plan complex propaganda and terrorist operations. Islamic extremists like Andrew Rowe, 33, are taking advantage of the elimination of borders within the EU to further their own ends. Rowe, a convert with a British passport, traveled all over Europe for years to meet with fellow Muslims. Investigators have reconstructed his travels across Germany, England and Turkey. They believe he was a courier traveling among militant cells, and he has also been traced to the group implicated in the Casablanca attacks. The transforming factor is an ideology, which can theoretically be learned and espoused by anyone. Finally, many of the people who carefully study the ideology and join with fellow-travelers report being filled with an extraordinary sense of assurance and resoluteness — "Only now does my life have a meaning," etc. How else would you be able to calmly kill yourself in public without betraying extreme fear? Islamic extremists, of course, don’t want to give the societies they’re living in a new "perspective on life." They don’t particularly care how Western society develops, they simply want to achieve specific political ends. So how has Europe responded to this threat? Der Spiegel finds the outcome decidedly mixed. Individual nations often have a good grasp on what’s going on within their borders, but transnational cooperation is spotty. Read the whole piece; it’s pretty interesting.